Throughout Chess history, nothing has made such an impact on the design of chessmen as the introduction of the English Staunton Chess pieces. The Staunton Pattern chessmen were first offered to the public for sale by Jaques of London in the Fall of 1849 and quickly became the standard for serious tournament competition. The original Staunton design was registered to Nathaniel Cook in the Spring of 1849. The design bears the name of the self-proclaimed world champion and English Shakespearean scholar Howard Staunton, who approved the new design and promoted it in his London Illustrated News chess column. Cajun Chess is proud to offer from the House of Staunton: The heirloom-quality Hastings Series Chessmen. 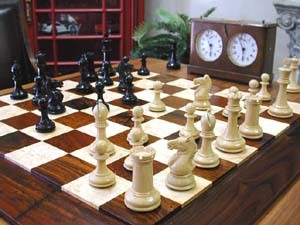 Crafted from premium Boxwood & Genuine Ebony, these Chessmen were created to commemorate the famous 1895 Hastings Tournament won by American sensation Harry Nelson Pillsbury. This period is widely regarded by many collectors as that in which the finest Staunton chessmen were produced. The form, broad bases, board-presence and distinct craftsmanship of these magnificent chessmen has all been recaptured, and here made available to you. 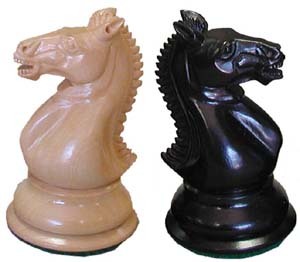 Unique to these exquisite chess pieces are the bold and magnificently-carved Knights. Nothing compares. The Hastings 1895 Series is a Limited Edition of only 200 sets. This set features a 4.0" King with a 1.875" diameter base and weighs an incredible 66 ounces. The chess set comes with gold-embossed leather pads on both Kings and a personalized Certificate of Authenticity. The set also carries an original manufacturer's label indicating its production number, affixed to the underside of each box.